Your MT4 username and password have not changed. Continue to trade with the same installation of MT4 currently on your computer. That seemed to work out reasonably well, and I'm now happily trading using my shiny new FXCM MetaTrader 4 account without having to install yet another flavour of MetaTrader. The biggest problem was that the times of the quotes changed by an hour, which meant I had to reconfigure some of my expert advisors in a hurry. However the ODL demo MT4 account that I use for testing purposes doesn't seem to have migrated in the same way. It still seems to be much as it was, except that when the markets opened for business last Monday quotes for a number of indices appeared to have stopped arriving. 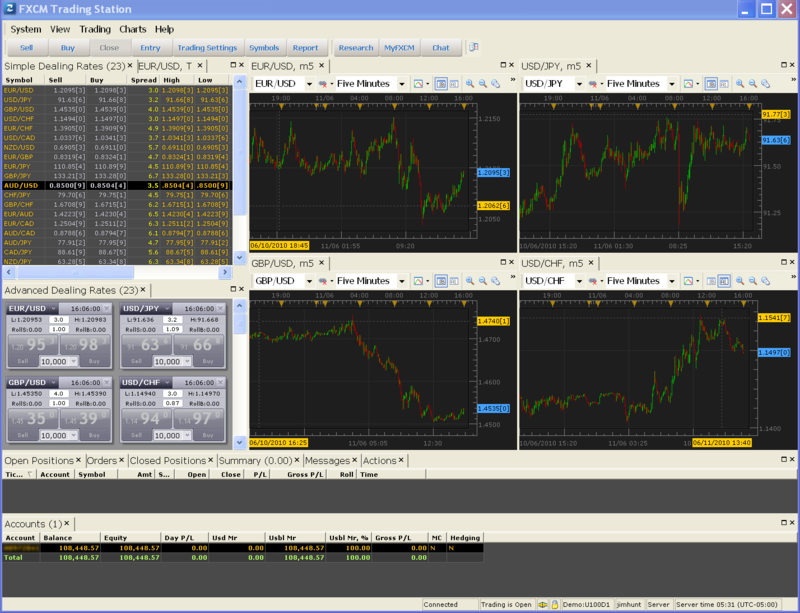 Download and install the FX Trading Station II (TSII) platform. While you will continue to place trades using the MT4 platform, you will use TSII to run official account statements and to access MyFXCM, your new online account management portal. Trading Station II has numerous features that MT4 does not, including: single-click trade execution, market range orders, mobile trading, and the ability to create stops/limits while placing market orders. The MT4 platform was not originally designed for No Dealing Desk execution. We have worked with a third party to make it compatible with No Dealing Desk execution. 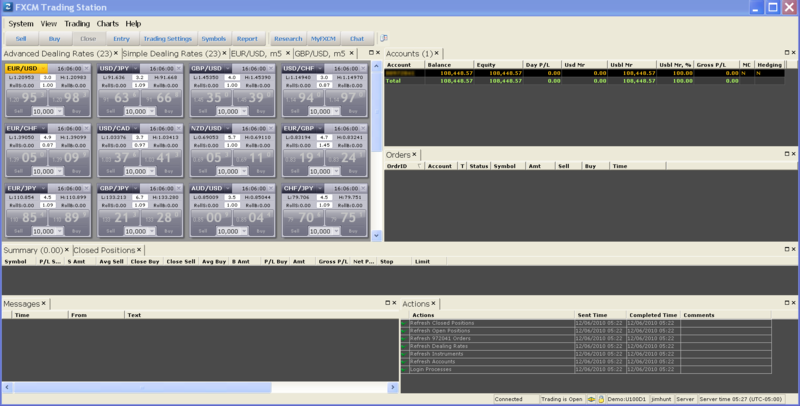 However, we recommend the Trading Station II platform if you are not automating trades with an Expert Advisor. Receive a 50 EUR/GBP/USD credit when you move your accounts over to Trading Station II. To receive this special offer, you must have an account balance over 5,000 units of the currency your account is denominated in. I can't wait to discover what's in the next email I receive from "ODL powered by FXCM"! Comments on FXCM Like the Look of MetaTrader? Boston Technologies – SCAM – FRAUD – AVOID!!! Boston Technologies is acting as Broker-Dealer/Marketplace without license and reserve funds… If the bridge failed, YOU WILL LOSE YOUR MONEY!! Be careful with the Ponzi scheme led it by Mr. George Popescu and Mr. Kevin Millien. While it is true that acting as a technology provider to the FX (OTC) space does not require NFA membership or CFTC registration, it is hardly the basis on which Boston Technologies (BT) operates. At face value, BT offers technology solutions to the retail FX market. However while this may hold true for many of their institutional clients, it is not so for much of their smaller clients. 1) BT holds clients funds on deposit with both regulated and non-regulated entities. 2) BT's technology defaults to the benefit of the broker (FCM/FDM). In the absence of a broker, BT is able to deploy their technology to their own benefit. A major conflict of interest. 3) BT claims to not act as anything but a technology solution but receive income from the spread, in many cases without the clients knowledge. This is either garnered in the form of an IB fee paid by the counterparty or by BT simply marking up the trades through price manipulation. 4) BT has recently chosen to move their business offshore (Boston Trading as opposed to Technologies), or at least the trading arm of it (to Belize). They believe this will give them greater flexibility in acting as a broker without repercussions from the local regulations despite the fact that they still take client deposits in the name of the US based company. This is just a cursory glance at the business. A more informed and thorough look will reveal further anomalies. FXCM claims that do not have any kind of business relationship with Boston Technologies. FXCM claims that they just have a normal and typical bridge as other Brokers. Don't be confused with the AD's in FXCM website, because if Boston Technologies stolen your money, FXCM do not have nothing involved directly. Can you provide any firm evidence for your claims that "Boston Technologies is acting as Broker-Dealer/Marketplace without license and reserve funds", or that George Popescu and Kevin Millien are in some way involved in a Belize based ponzi scheme? Those are quite some accusations to make after all! Boston Technologies doesn't have its own Brokerage. Our business model is different. We do not want to compete with our customers. We think there is a larger business opportunity to create brokerages as we do not have many competitors. There are also numerous forex organisations with the initials "FXCM", and it doesn't always stand for ForeX Capital Markets either. Boston Technologies Inc. claim to provide their bridge to numerous spot forex businesses apart from FXCM Holdings LLC and its subsidiaries. Are they all implicated somehow too? As the Head of Compliance for Boston Technologies I would like to take this opportunity to offer a response to the accusations made by Mr. Alcocer. Boston Technologies and BT Prime operate a transparent business model that is clearly explained on their respective websites http://www.bostontechnologies.com and http://www.bttprime.com. The officers and individuals working at BT are industry professionals with many years of experience serving the forex community. BT is fully staffed in all areas of operation including compliance, legal, and accounting to solidify and maintain the integrity of the firm. I would like to make it clear that BT and its affiliates do NOT conduct any business with the retail public, only sophisticated institutions. BT does business with many top tier banks and brokers. The due diligence process such institutions go through before committing to any business relationship is extensive. The fact they have chosen to do business with BT and its affiliates speaks for itself. I would urge anyone reading this forum and the community at large to spend some time reading the websites and invite you to give BT a call with any questions you may have. 2. Boston Trading and Research Inc.
Boston Technologies is using Financial Institutions to trying to sell his "bridge", and created a confusion with his clients, trying to deposit the trading money in Boston Technologies banking account. If you are a Financial Institution and acting as broker-dealer without the "escrow reserve", and you have trouble or technical issues, or simple loss, you cannot afford the loss. Thank you for taking your time to respond and getting attention about my personal experiences with Boston Technologies. I would like to introduce myself. My name is Michael Brand and I am the Compliance Officer at Boston Technologies. My role at BT is to ensure that all of our collective interests operate efficiently and safely within industry and legal guidelines. The purpose of an effective compliance program is to offer maximum protection from any liability that may arise during and through the course of business. It is for this reason that I am now asking you to provide us with basic documentation as listed in an attachment to this email. By providing these documents you can help ensure that basic regulatory guidelines are being followed. Additionally, I am attaching an updated copy of our Client Agreement for your signature. In order to comply with global regulatory requirements and to further protect both our clients and ourselves from liability we have formed a new entity that will be a party to your Agreement. Please be advised that once signed, any prior Boston Technology Agreement will be transferred to BT Trading Ltd. This is strictly an operational change and will not affect any ongoing business. Business will continue as usual without any interruption and you will continue to benefit from the same excellent services and products that you have received thus far. Please return to us a completed and signed Agreement along with any documentation requested in the Application part of the Agreement within 7 days of receipt of this communication. I apologize if this will inconvenience you in any way but I do appreciate your cooperation in submitting these documents to us as soon as possible. I am looking forward to working with you in the future in an ongoing basis. Please do not hesitate to communicate with me by any means to share any concerns or if you have any questions. We are talking is the true, and we will get that our claims the NFA (National Future Association) and CFTC (Commodity Future Trading Commission) get this claims seriously and proceed against your company. Any question regarding this, please also let me know. I will very happy to help you. Thanks for the additional information. It sounds like you had some sort of business relationship with Boston Technologies Inc., which perhaps turned sour for some reason? You have presented some prima facie evidence that Michael Brand is or was involved with entities called "Boston Technologies", "Boston Technology" and/or "BT Trading Ltd." However I am still very unclear about the relationship between any of those "BTs" with the first 2 names on your list. For reasons obvious to anyone who cares to Google those names, they were the sort of businesses that give the forex industry a bad name. However my own brief research thus far provides no hint of any relationship between the management of Boston Technologies Inc. and that of Tradex Swiss AG and/or Boston Trading and Research, which appears to be LLC rather than Inc..
Boston Technologies is led my Mr. George A. Popescu. This guys was related with Tradex Swiss AG and Boston Trading & Research Inc. Also, we runs his actual business with GAP Technologies Inc. The "new" corporation to avoid the US Prosecution about his illegal activities in the US is BT Trading LLC, that is a new corporation registered in Belize. With this "off-shore" corporation, he do not have any kind of regulation, and avoid the US Regulations, hide the money in "off-shore" banking account and tried avoid the US Claims that ex-clients and injured customers have against his activities in the US. I hope that I can be very explicit regarding your confusion of this company and related companies. FXCM shut down from their website "powered by Boston Technologies" the MT4 Platform. This new event shows that the firm are not more involved with Boston Technologies and his illegal activities. We expected that the other financial institutions broke and stop doing business with Boston Technologies, because is extremely evidence that they are not doing their business in the ethic and legal way requested in the financial industry. I clicked your second link, then I clicked on FXCM's "Download MetaTrader4" button. I was informed the resulting file was being downloaded from Boston Technologies web site. FXCM have been pushing their own Strategy Trader platform recently, and highlighting the benefits of not using MT4 bridges. Nonetheless they still appear to be continuing their relationship with Boston Technologies. Even if that were to change in future, it seems far more likely to be for technical and/or financial reasons, rather than anything to do with supposed "illegal activities" on the part of Boston Technologies. As I mentioned previously, my own researches have thus far not uncovered any sort of relation between George Popescu and Tradex Swiss AG or Boston Trading & Research Inc. You have still not provided any evidence, "explicit" or otherwise, of such a link either. I'll go Google "GAP Technologies Inc." and "BT Trading LLC" now, and I'll let you know what, if anything, I discover. FXCM have some claims with clients with failed problems of the "bridge" that BT provided. We have communication from BT that shows that they have internal technical problems in the mt4 servers that results in technical problem in the bridge. Who is responsible for the crashing and failing of the mt4 servers and bridge of Boston Technologies? BT are a financial institution regulated that in case of controversy with a client, go to a public agency to review the client situation? Please let us know any useful information. Tradex Swiss AG – Boston Trading & Research – Gap Technologies – Boston Technologies – BT Prime have the similar team member, officers, and offices locations in the track history. Please look the public records regarding this companies, and you will see a clear connection with the exact physical office address, and all company are related to Mr. George Popescu. Is very interesting… FXCM and Boston Technologies has business relationship from the past. Mr. Kevin Millien, actual CFO from Boston Technologies, was in the past VP Institutional Clients at FXCM. We have serious claims against BT and FXCM. Because BT is using the trade name of FXCM for selling their own MT4. FXCM contacted us last week, and they notified us that they are taking out from the website BT information, also you see that BT take off from the website info about FXCM. I am waiting for the CFTC report and our claim against BT, as soon we get it, I will make it public and publish. I'm afraid it's still not clear to me what you are trying to achieve here. I can however assure you that you are going about it the wrong way. If you "have serious claims against BT and FXCM" then take it up with them. If that doesn't prove satisfactory then by all means put "[y]our claims [to] the NFA (National Future Association) and CFTC (Commodity Future Trading Commission)" if you think that will help. If you are somehow trying to pass on your experiences to help others avoid your own "misfortunes" then "spamming" blogs is not a particularly effective way of getting your message across. My previous level of spam protection is now classifying your comments as spam, which probably means one or more other webmasters have already categorized your comments on their blogs as "spam". I have also now been forced to increase the level of spam protection on this blog, which is in no way beneficial to other commentators here, not to mention a waste of my (to me at least!) valuable time. To answer some of your specific points, as I have previously mentioned I have already looked at the public records. For some strange reason you leave me with the impression that I showed you how to do that. George Popescu is indeed listed as an officer of more than one business with offices at the same address. That is not uncommon, improper or illegal. I myself am listed in the public records as being an officer of more than one company with offices at the same address, for example. There is also nothing uncommon, improper or illegal about sharing an office building with other unrelated businesses. It happens all the time, all over the world. It is also not exactly front page news that MetaTrader 4, whether in conjunction with BT's bridge or not, suffers from some technical difficulties from time to time. I have even documented some of them on this very blog. What I personally find difficult to understand is why anyone who had done their due diligence would let MetaTrader 4 take charge of substantial amounts of their own money, or anyone else's come to that. So what is the connection between the two guys arrested in Boston last week with "Boston Trading & Reseach" and "Boston Technologies". Whats the deal here? Are these guys (B.T.) going to be the next ones arrested? The blog post you refer to was apparently written by the very same person who made much the same allegations in earlier comments here, and on a number of other blogs also. Other than the similarity between their names and their geographical location no evidence of any connection between BTR and BT has been forthcoming. It therefore seems extremely unlikely anyone from Boston Technologies will be arrested.